 Centrally located just 500 meters from historic center and the Basilica of St. Francis. The hotel boasts a total of 155 rooms, a SPA, a wellness center, conference centre, a large covered garage, a private coach parking area, n.2 restaurants, banqueting facilities, wellness centre with heated indoor swimming pool and even a romantic panoramic roof garden, park. 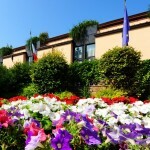 Country Hotel Fattoria di Vibio Resort & SPA Loc. Doglio - Tel. +39 075 8749607 - Fax +39 075 8780014 • Surrounded by the verdant countryside of what is considered one of Umbria's most unspoilt areas, at 600 metres above sea level the Fattoria di Vibio farmhouse residence looks out over a beautiful valley and the Monte Peglia, near Todi and Perugia. Swimming-pool and SPA. The owners Gabriella, Giuseppe and Filippo have always attached considerable importance to creating a homely atmosphere where guests can relax and feel at ease. The surrounding area is perfect for walking or riding through the woods. Mountain bikes are available for those who prefer this sport, as well as tennis and a small lake for fishing.